North Dallas Business Women was formed on May 10, 2013 and Charted as an official Express Network of the American Business Women’s Association on October 11, 2013 with 45 primary and 7 secondary members. Our chapter is proud to be one of more than 450 chapters with a diverse ensemble of women, and men, from an array of professional backgrounds such as Marketing, Recruiting, Litigation/Attorney, Direct Selling, Financial Services and Life Coaching. We are committed to host monthly personal and professional luncheons to develop and strengthen your individual and team skills in a safe environment that you might not otherwise have an opportunity to develop. There are also quarterly special events to help build stronger relationships in a more relaxed and fun atmosphere. Our topics, speakers and event ideas are geared towards what our members have said is where they feel they have an opportunity to grow. 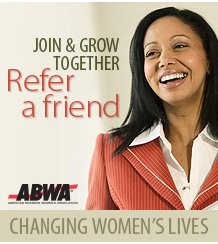 The mission of the American Business Women’s Association is to bring together businesswomen of diverse occupations and to provide opportunities for them to help themselves and others grow personally and professionally through leadership, education, networking, support and national recognition. To provide a place that allows and encourages women to explore who they are personally and professionally with the resources and support to reach their potential and build lifetime relationships.